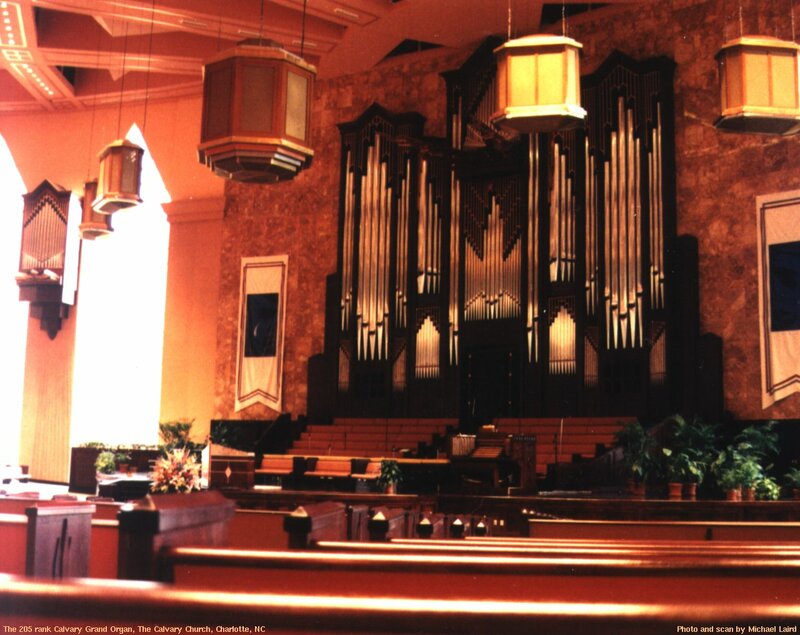 Here is a brief photo tour of the 5-manual 205-rank Möller pipe organ at The Calvary Church in Charlotte, NC. I was able to take these pictures thanks to the generosity of Dan Miller, former organist and Minister of Music at the Calvary Church. If you'd like to see a larger version of any of these pictures, simply click on the small photos embedded in this page. 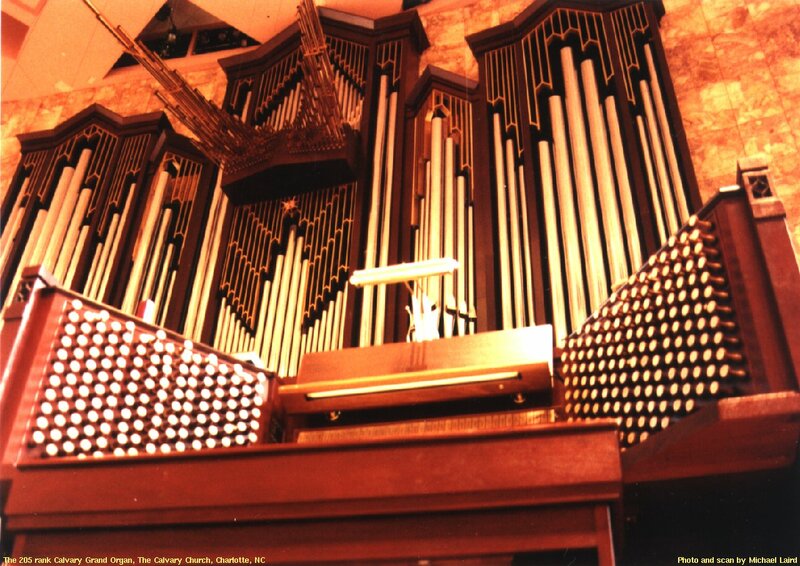 Since this instrument is so large, it has secured a place on the Largest Pipe Organs list. Here is the main organ case with the 5 manual console in front. The trompette en chamade at the top of the façade is called the "Millenial Trumpet", is on 10" of wind, and has full-length 16' resonators. The rest of the organ case is primarily made up of the 32' Contra Violone and the 32' Contra Principal. Here is a view of the console looking up at the main organ case. You can clearly see the full-length 16' resonators on the Millenial Trumpet from this angle. 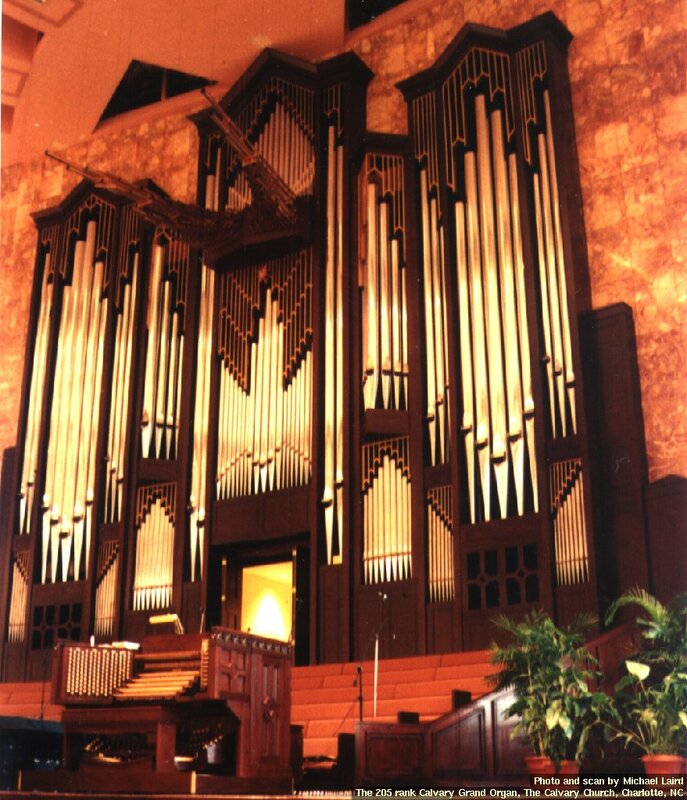 Keep in mind a sense of the size of the organ case; remember that the pedal pipes in the façade are full-length 32' pipes! This view is from back pretty far in the auditorium, looking at the main organ case. You can also see the Trompeteria I/Ancillary I division in its own separate case on the left. There is a matching Trompeteria II/Ancillary II division like it on the right (out of view in this shot). Here is a shot from the leftmost corner of the first balcony, looking across the front of the auditorium. Here you can see the en chamade trumpet pipes of the Trompeteria I division on the left, the main organ in the middle, and the Trompeteria II/Ancillary II division on the right. 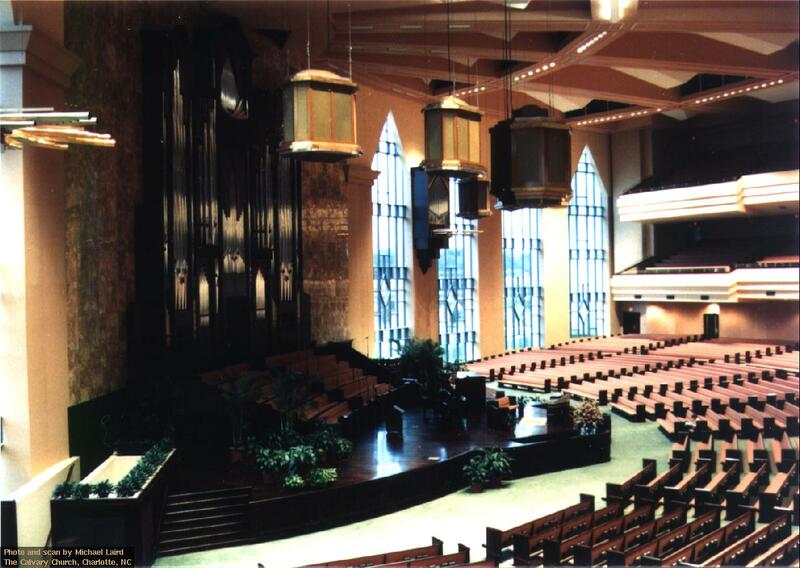 The auditorium seats about 6,000 people, and contains 2.5 million cubic feet of airspace. Dan Miller was very kind and allowed me to play this huge instrument for a good while. Here is a picture of me playing "Trumpet Tune" by David German, the former minister of music at this church. 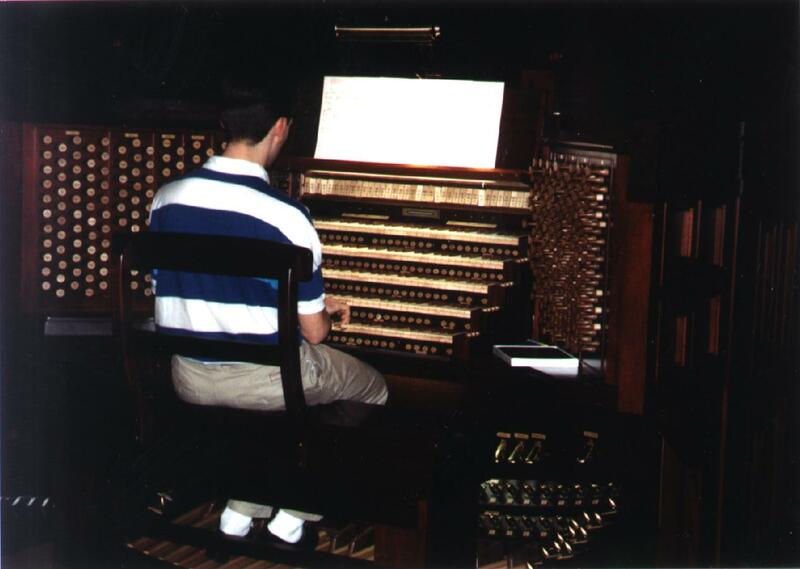 He wrote this piece for the dedication of the Calvary Church organ. It sure was fun to be able to play the piece on the instrument it was written for! These pictures are copyright 1991-1999 by Michael Laird; all rights reserved. Permission is granted to use these photographs for personal and non-commercial use.